Have you ever had watermelon feta salad before? It’s a wonderful combination of sweet, salty, refreshing and brightness all in one bite ! 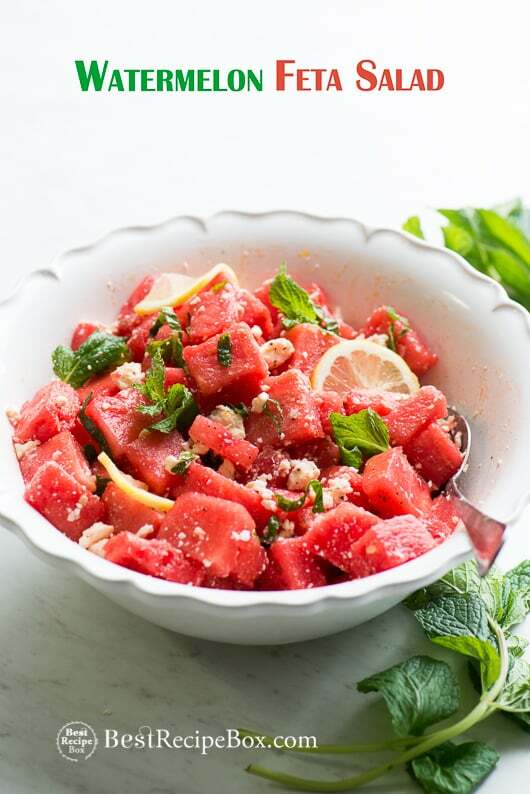 Refreshing watermelon feta salad is a super easy and popular Summer salad recipe. There’s so many reasons why this salad is so fantastic. 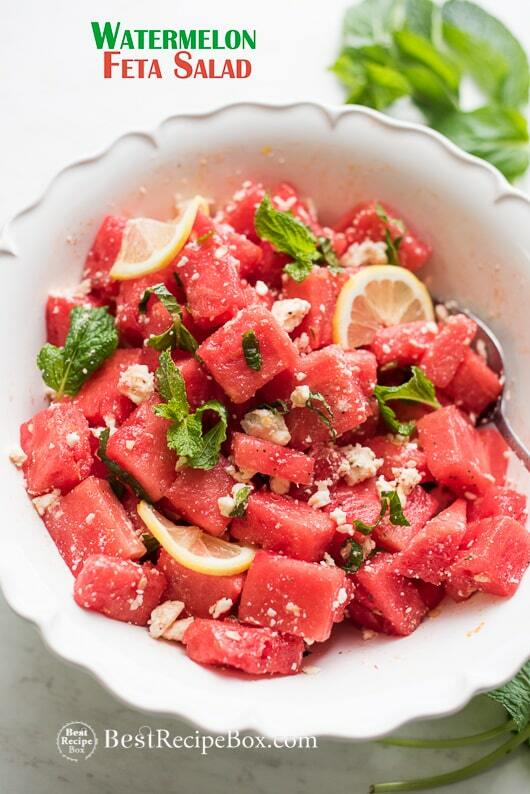 The sweet chunks of juicy watermelon combined with salty feta cheese is amazing. It’s the contrast of sweet and salty that makes each bite so wonderful. Add some chopped mint and it’s floral scents and flavors take this salad to another level. Everything about it is super satisfying, cooling, refreshing and perfect for your Summer Menu. This easy watermelon feta salad recipe takes less than 30 minutes. The only real time factor is cutting the watermelon. There’s so many different ways to cut a watermelon and we have a few different ways that teach you how to chop up the juicy beast! 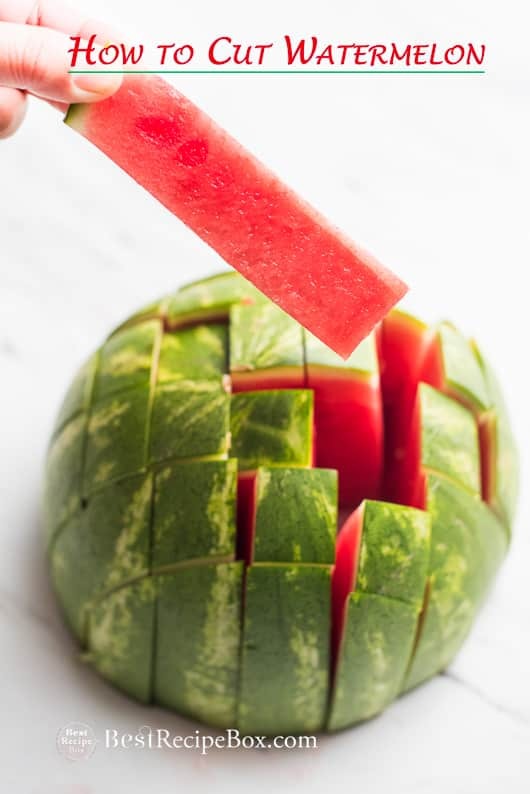 If you have a great watermelon you don’t want any of it to go to waste, so we have a tutorial on how to cut watermelon into stick so that you can savor every single bite with little waste. 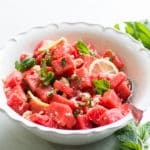 After you cut the watermelon, all it takes is a few other fresh ingredients, toss it all together and you have one of the best Summer potluck salads to take to your party. Everyone will be surprised at how delicious and refreshing this salad is on a hot Summer day. Enjoy! 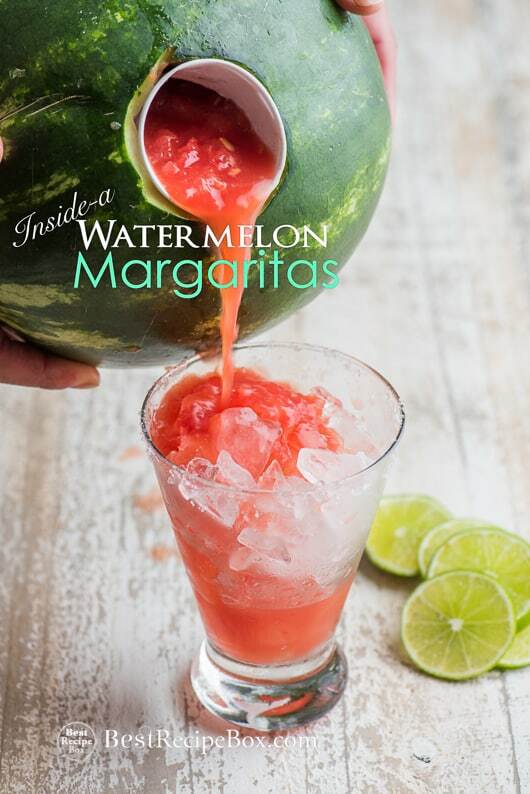 Wonder How To Cut a Watermelon? Watch our video Tutorial Here. This recipe was originally published 2017 and re-published in 2018 with an updated video! 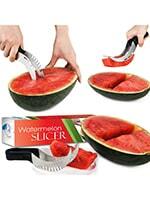 Watermelon Slicer – We’ve never had one or used one, but they always make us curious! 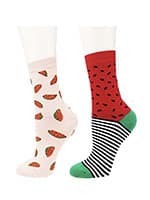 Watermelon Socks – Who doesn’t love a juicy sock! 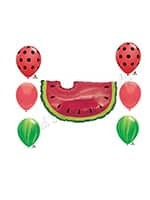 Watermelon Balloons – Who took a bite out of the balloon? See post above for more recipe details. In large bowl combine olive oil, lemon zest, lemon juice and mint. Stir to combine. Add feta cheese, black pepper. Gently toss to combine all ingredients. Taste for seasoning and add more salt if needed. Serve chilled.